Showing results for tags 'Kevin Williams'. 77127, Vermin Beetles Dark Heaven Bones sculpted by Kevin Williams painted as Giant Fire Beetles. As you walk down the catacomb, two huge nightmare blue spiders sneak out from holes in the crumbled walls... 77126, Vermin Spiders Dark Heaven Bones sculpted by Kevin Williams. Painted this guy up real quick for a game I'm playing in. This was my first real use of the airbrush and I had a few flubs with the blending but overall I'm good with the results. Reaper Miniatures 03477, Brain Horror. Dark Heaven Legends model sculpted by Kevin Williams. This Aberration can also be found in the 10031, Dungeon Horrors Box Set. I used transparent blister plastic and Mod Podge to create the drool. I also covered the brain with two layers of Mod Podge to give it a slimy aspect. The stalagmites and base were carved out of green stuff to represent an oozing cave. Super quick paint job for these guys... My son wanted them for the Dragon Rampant army I'm painting him for Christmas, and I've still got a lot more to do so I everything I do in the next while is likely to be a bit rushed. Base coat was Vallejo Model Air, Armour Brown, then drybrushed heavily with Desert Stone, lightly with Dirty Bone, then a little more heavily again with Olive Drab. The Olive Drab doesn't really show up in the picture but it's pretty decent in person - not overpowering, just enough to make them look more like old trees. 03483, Slime sculpted by Kevin Williams. Also available in in 10031, Dungeon Horror Boxed Set. I have more orcs to paint, but I'm gonna switch it up for a bit and do some Spooky Scary Skeletons! 80038 - Bathalian Centurion --- An Amazing Mini Exchange.. This guy turned out OK, but I could definitely do better. The edges of the armour plates on the back shade towards purple but it barely shows up at all in the pictures... and the belly plates are just the wrong colour entirely. This is the Secret Sophie miniature I painted for Generic Fighter. I removed the wings so they didn't block as much of the mohawk. This guy was fun to paint, though I forget how much longer larger models take sometimes. Sorry about that. Hope you enjoy him! Hello again friends, below is my vision for the new Moandain, Arch Lich. Not a huge fan of the name, but I loved the concept of the sculpt when I got it in my hands. 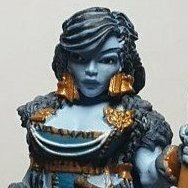 A great opportunity to work on OSL painting. He was painted with all Reaper MSP and a Reaper Round#1 brush. I realize that he's a tad on the audacious side with respect to color but after all the bugbears I've been painting, I felt like letting this lich get his nobility on. Plus, I liked the idea of his emerging from the crypt and his color changing as his form regained a solid state; perhaps his phylactery has just reached a full reboot. I tried increasing the brightness of the photos better so as to get chaosscorpion off my back for a change. Finally getting caught up a little. This fellow's from the last batch I did, but I just finished his piddling base yesterday. Kevin Williams's Lesser Earth Elemental. I loooove this mini. Wish they made a larger version of him. Perhaps in a much-cheaper plaster material of some sort. Perhaps white. Anywho, I decided I didn't want to go gray. My rocks are always gray. Gonna try adding content here for the first time, as Photobucket's hit my last nerve. Thanks for looking!